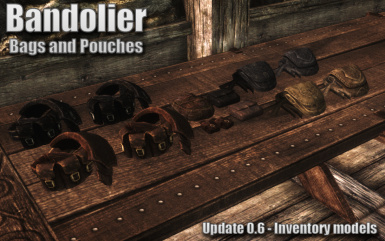 Adds lots of pouches, bags and bandoliers to help easing your burden. 1. Your translation upload must NOT contain the .BSA file or loose texture or mesh files, making the original mod a requirement. 2. 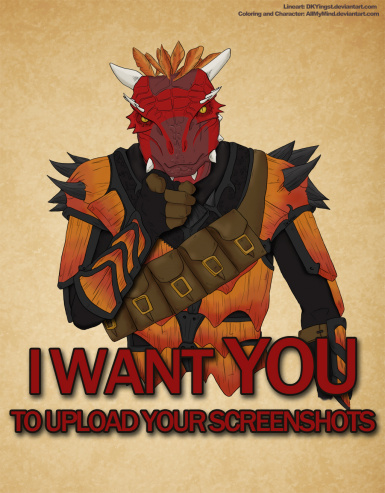 You must credit the creator, if you upload it anywhere else than Nexus. Than you for your understanding. Thanks to AlphaWoIF for his permission for using some Witcher2 models he prepared. Fixed a small hole in pouches. All box pouches are now shader-friendly. Vial belts are entirely shader-friendly. Pouches have proper havok material set (cloth) so they won't sound like metal when dropped. GNDs (world objects) collision meshes are set to be identical to object meshes and/or have fixed collision parametes. Fixed BSLightingShaderProperty settings, added Tangents and Bitangents data. BSInvMarker added to better initial view of object in player's inventory. Fixed recipe for Dark Vial Belt. Changed the enchantment school to "NONE" to hopefully prevent it from conflicting with other mods (also counts as vampire-hotfix). Added Pouches to Left and Right sides as well as back, so you can now make a nice pouch belt all around your waist. Comes in Leather, Dark and Pale colors. Changed names (again) for better sorting. All the items are now under “Leather” category in Tanning rack. ”Gray” items are now “Pale”. Dark satchel that you had are now “Pale”. Very sorry about that. Added 2 Pale Satchels and 6 Pale Box Pouches. New texture for Dark Satchels. Added 2 Vial Belts. Leather and Dark versions. No shoulderless ones yet. Added 8 Vial Holders. Leather and Dark versions. Back L, Back R, Front L, Front R.
Added 4 Book Holders. Leather and Dark versions. Back L and Back R.
Added 8 Pouches. Leather, Pale, Dark, DB. Front L and Front R. They look like pouches from Bandoliers. 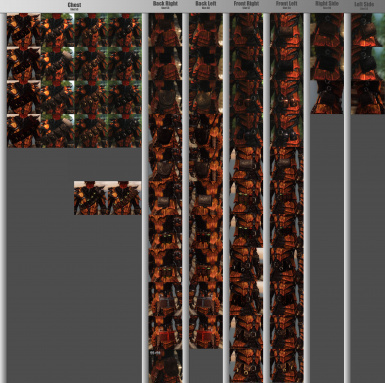 Added a new color pattern for Bandoliers – Dark Brotherhood. 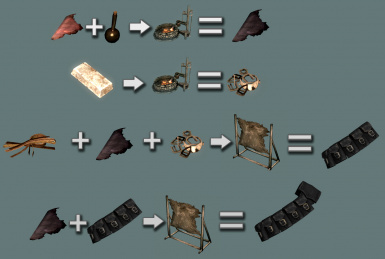 Dark Brotherhood items require a recipe that can be found somewhere in DB sanctuary. You cannot see the crafting recipe without it. Added new material for DB items: Crimson Dyed Leather. You will learn to craft it from the same recipe as the items. You can upgrade small bandolier into larger ones at the tanning rack. Both shoulderless and with shoulderpad. The upgrade recipe will only be visible if you have small bandolier in your inventory. No more stretching on Male Bandoliers at some animations. Fixed a bug, where bandolier would stick to the head and have messed up polygons after decap. 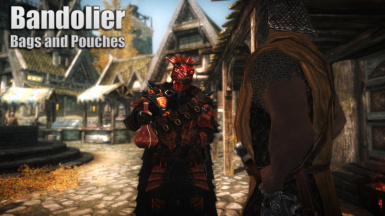 Large Shoulderless bandoliers now have the right enchantment. Belt bag now uses both back-right and sied-right slots to avoid nasty collision with right sided pouches. You can now disenchant the items to learn the normal "Increase Carry Weight" enchantment. You can now enchant the items with +carry weight and a few others. (you can use an optional, enchant-less file or do a double-enchant). Added a new color set for bandoliers - gray (or you can call it pale). 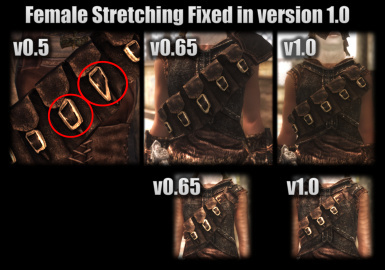 Finally fixed the stretching on female bandoliers (see screenshot). Changed meshes for the box pouches. Added 4 new bandoliers without the shoulderpad, 2 dark small pouches, 8 box pouches for other slots. Changed some bandolier meshes for less clipping. Female large bandoliers now have slightly less stretching. Changed crafting system, to use Assorted Buckles, which are crafted at the forge. You now start by crafting a shoulder-less bandolier and can add a shoulderpad later on. Removed the green glow from the inventory model. Added new inventory models to all items. 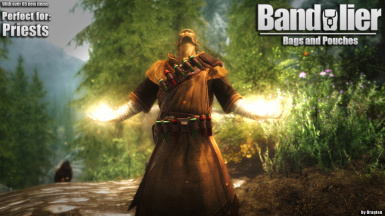 Changed the slot for the bandoliers from 56 to 53 so they would not conflict with dwemer goggles. Fixed Large Bandolier for custom weight characters (2 to 99). Added Inventory models for all bandoliers. Fixed an issue with Wood Elves having invisible items. This page might answer any questions you might have about this mod. 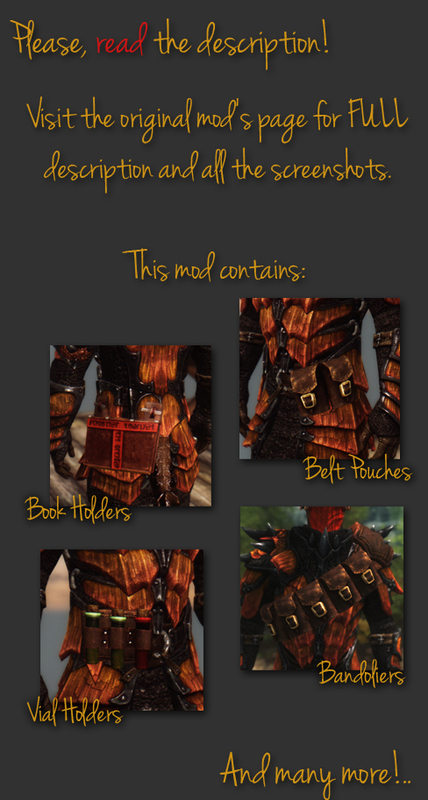 Click here for a mod that adds these items to NPCs. Click here for a UNPB patch. Have you ever left behind tons of useful stuff, simply because you could not carry anymore? 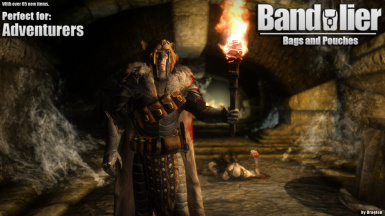 How many dragon bones, dwemer scrap or other valuable things were abandoned? Too much to count. But now, there is a solution just for you! "Bandolier - Bags and Pouches" offers you a wide selection of various equipment items that should ease your burden! And it can be used with nearly every armor! What does this mod have to offer? 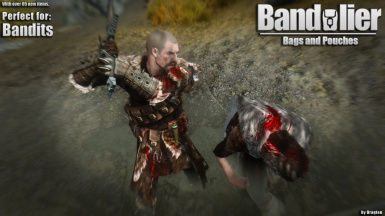 This mod offers you many items that will increase your carry weight. At the moment, there are 7 new slots for the equipment: Chest, Back Left, Back Right, Front Left, Front Right, Left Side and Right Side. Different items can be quipped into different slots, so you can combine up to 7 different pieces. At the moment, there are 67 different items available. Small pouches add 25 extra carry weight. Satchels, bags and box pouches add 50. But you can also use an optional file that provides no enchantments by default. Copy the .esp file into your data folder and overwrite the existing file. To see which slots the items are, using and how you can combine the items, look at the screenshot above. You can find videos showing the mod's features under "Videos" tab. Keep in mind that most of them were made with older versions of the mod. Extract the files from the archive into your Data folder. Check the Dr_Bandolier.esp in your "data files", in the launcher. If you wish to uninstall the mod, make sure to unequip the items first. Otherwise you will still have the permanent effect on your character. All items are crafted at the tanning rack. However, some items may require extra things that can be crafted at the forge. Black Dyed Leather is crafted by combining Leather and Frostbite Venom. Assorted Buckles are crafted at the forge from Steel Ingots. To make a bandolier with a shoulderpad, you must first make a regular one, and then, combining it with an extra piece of leather at the tanning rack, you can create bandoliers with shoulderpads. To make Dark Botherhood Items, you must first get the recipe from thier sanctuary. If you cant find it, look for the spoiler in the bottom of this page. You can upgrade your small bandoliers into the large ones. The recipe will only show if you have small bandolier in your inventory. There might still be some bugs. Please, report them (just make sure they are not already on the "known issues" list bellow. Feel free to upload your beautiful screenshots to this mod! Add the mod to your tracker to see when it get updated. There are plenty of translations available on Nexus, please search for them individually. v1.2 - Some minor fixes. v1.2 - Changed the enchantment school to "NONE" to hopefully prevent it from conflicting with other mods (also counts as vampire-hotfix). v1.2 - Integrated ttl269's mesh fixes. v1.2 - Added Pouches to Left and Right sides as well as back, so you can now make a nice pouch belt all around your waist. Comes in Leather, Dark and Pale colors. v1.1 - *Changed names (again) for better sorting. v1.1 - *Dark satchel that you had are now “Pale”. Very sorry about that. v1.1 - *Added 2 Vial Belts. Leather and Dark versions. No shoulderless ones yet. v1.1 - *Added 8 Pouches. Leather, Pale, Dark, DB. Front L and Front R. They look like pouches from Bandoliers. 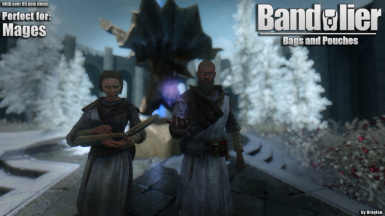 v1.1 - *Added a new color pattern for Bandoliers – Dark Brotherhood. 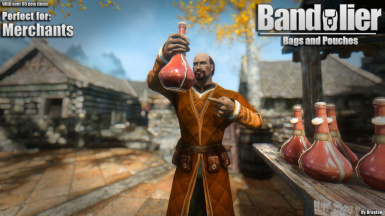 v1.1 - *Dark Brotherhood items require a recipe that can be found somewhere in DB sanctuary. You cannot see the crafting recipe without it. v1.1 - *Added new material for DB items: Crimson Dyed Leather. You will learn to craft it from the same recipe as the items. v1.1 - *You can upgrade small bandolier into larger ones at the tanning rack. Both shoulderless and with shoulderpad. The upgrade recipe will only be visible if you have small bandolier in your inventory. 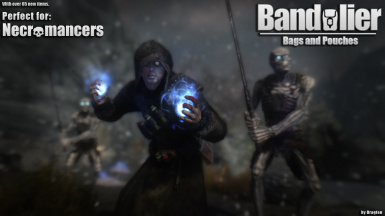 v1.1 - *No more stretching on Male Bandoliers at some animations. v1.0 - *Belt bag now uses both back-right and sied-right slots to avoid nasty collision with right sided pouches. v1.0 - *Finally fixed the stretching on female bandoliers (see screenshot). v0.65 - *Changed meshes for the box pouches. 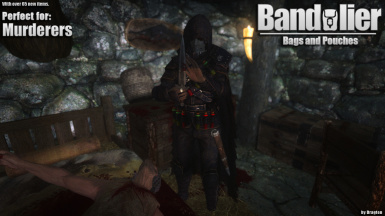 v0.65 - *Added 4 new bandoliers without the shoulderpad, 2 dark small pouches, 8 box pouches for other slots. v0.65 - *Changed some bandolier meshes for less clipping. Female large bandoliers now have slightly less stretching. v0.65 - *Changed some item names. v0.65 - *Changed crafting system, to use Assorted Buckles, which are crafted at the forge. v0.65 - *You now start by crafting a shoulder-less bandolier and can add a shoulderpad later on. v0.65 - *Removed the green glow from the inventory model. Also available on Steam Workshop! Always the updated version. 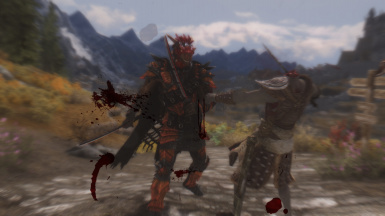 This is a small list of mods that use some of the special slots, and do not conflict with this one. 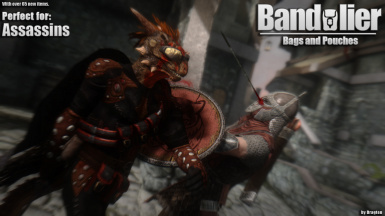 The mod might conflict with any other mods that use the same slots (48, 55, 53, 57, 58, 52, 59). *The Back right book holder is not shaded correctly and may appear darker/lighter than it should. At the moment, I have no idea what is causing it. Please use the back left instead. *Some items may appear a little bit too far from the body. It is an issue that is almost impossible to solve, be cause of many different armor sizes. It is especially very visible on naked characters. *When dropped, items sound like they are made of metal. No idea why it is happening, I have tried many things to fix it, with no avail. Huge thanks to all the people on Bethesda Forums who helped me to sort out a few problems I had with the creation of this mod. Thanks to dkyingst.deviantart.com for the lineart for the poster.